If Donald Trump were to weigh in on value stocks this year, he’d call them ugly losers. Growth stocks on the other, in particular the “FANG” names, have been been extremely rewarding to investors. Netflix is up 110% this year, Amazon is up 95%, Google is up 35% and Facebook is up 32%. What’s so impressive about the way these stocks are performing is that they’re doing it in a low energy market. Only half the stocks in the S&P 500 are positive YTD while the average stock is up just 0.15%. Value stocks relative to their growth counterparts are experiencing historic under performance. In order to take a closer look at this we’re going to be using the HmL factor (high minus low). This takes the return on small and big value stocks minus the return on small and big growth stocks and leaves you with the relative performance. 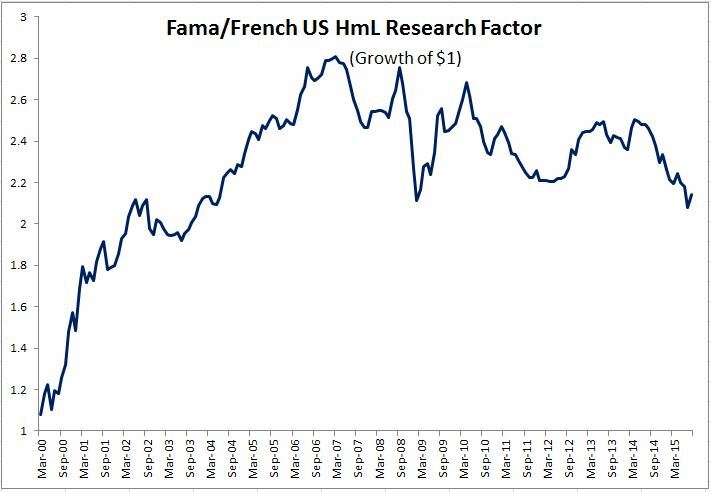 When the market topped in March of 2000, value stocks relative to growth (from here on referred to as HmL) went on a monstrous run, advancing nearly 70% in just twelve months. However, HmL has spent the last decade mostly going sideways. In fact, over the last ten plus years, you would have been much better off investing in all stocks, rather than emphasizing value. Again just to be clear, the blue line is not value, it’s value less growth. 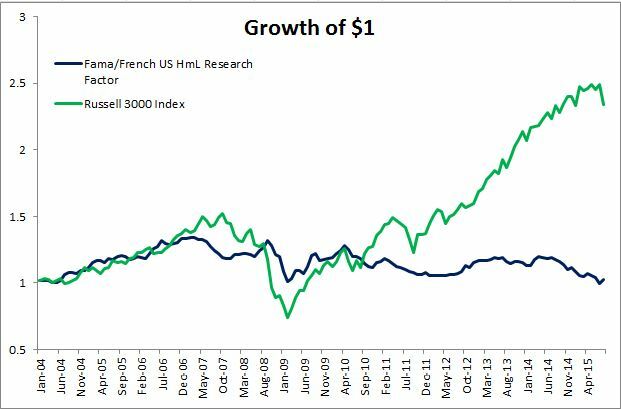 Value has performed fine over the last ten years, it just didn’t outperform growth. The value premium, like any strategy worth pursuing, doesn’t show up every year. Just a quick glance at the chart below reveals a coin-toss like bet. 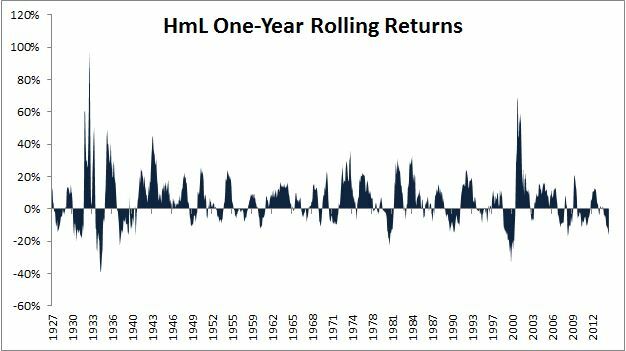 HmL has been positive 62% of all rolling one-year periods. Over ten years, or three investing lifetimes, the value premium becomes much more reliable. 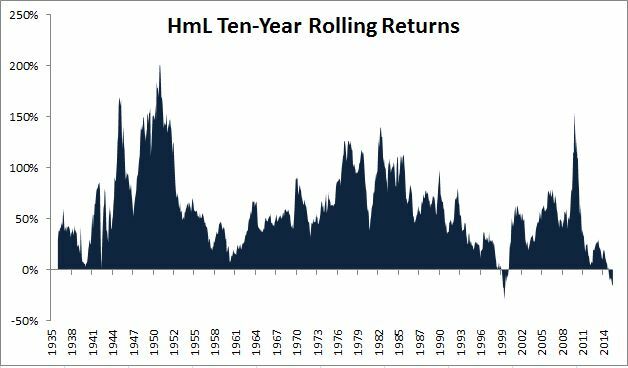 The HmL factor has been positive on 930 of all 951 ten-year periods, or 98% of the time. Right now we’re in the two percent. This is the worst ten year period for value relative to growth since the late 90s. So what is going on? What’s is the reason for the compressed value premium? 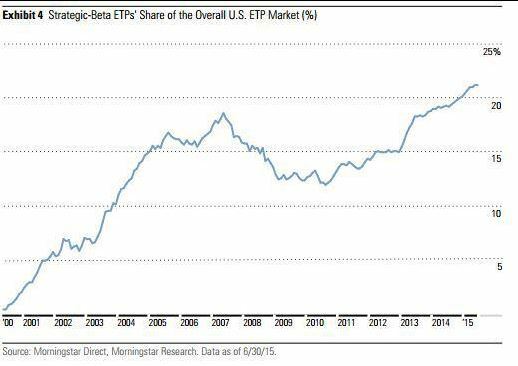 My first thought was the rise of smart beta strategies. It seems that everyone is trying to capture the premium, which paradoxically has caused it to temporarily disappear. 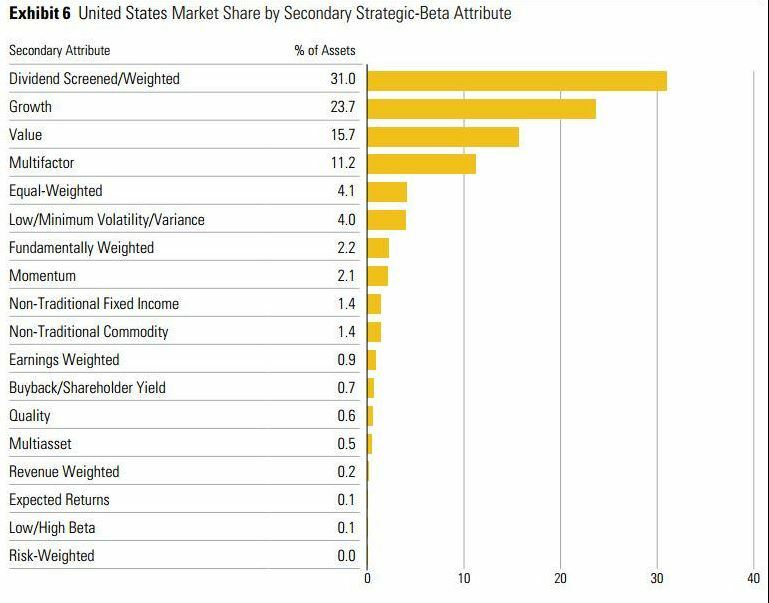 Look at the rise of “strategic beta” products. If we take a closer examination, this idea that the rise of these alternative indexes are having an adverse effect doesn’t necessarily pass the sniff test. To my surprise, growth has been more heavily targeted in this universe than has value. Moving on to another theory. Maybe the spread between value and expensive stocks compressed enough to the point where it made sense to favor growth. According to “Jake” who writes great stuff over at the EconomPic blog, small value did in fact get more expensive than large growth in March 2011 for the first time ever. He notes that since that time, small value is up just 28% while large growth is up 66%. This is fascinating and could definitely have helped drive the wedge between growth and value. Perhaps the real answer comes down to something really simple, the underlying holdings of value and growth. For the past ten years, financial stocks have been between 20 and 30% of the Russell 3000 Value Index. Financials have obviously been horrible and they’re the only sector which never eclipsed their 2007 highs (still 35% below). Energy and Utility, which make up another ~20% of the value index are the only other sectors currently below their 2007 highs. These three sectors make up nearly 50% of the index and just haven’t been conducive to making money. Below is a table of the five largest value and growth stocks and their returns over the last five years. Again, it’s not that value stocks haven’t performed, it’s just that they haven’t performed relative to growth. With the benefit of hindsight, social over oil and iPhones over iBanks have been extremely obvious. But with the spread becoming so pronounced, is now the time to take the other side? I don’t think it ever makes sense to make all or nothing bets. Furthermore, attempting to time mean reversion is almost always a losing proposition. These sorts of trends can go on much longer than one would think so it probably makes more sense to watch than to act. Data provided by Returns 2.0.